Just this morning, while watching a show on the History Channel about the island of Crete and Minoan civilization, when they mentioned Minotaur it got me thinking, I haven’t heard from Chicagoans Lair of the Minotaur for a while ... Nah, it isn’t how it went at all, but if it was, it would have been a nice way to start my review. What happened truly was me seeing a Lair of the Minotaur promo for an EP Dragon Eagle of Chaos, and getting an itch for something heavy to blast my speakers. 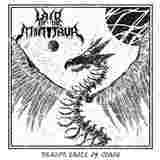 With Lair of the Minotaur if there is one thing you can absolutely count on it is unabated heaviness. Dragon Eagle of Chaos is absolutely no exception, as hefty and dense immensity is simply impersonated by these two tracks. An amp blowing, slow torture fuzz, plus cymbal work, gathers strength for a minute on the title track, and then the band picks up speed. Drums and bass are howitzers sowing destruction on my eardrums, while voice is rather legible, since you do not need to scrap the bottom vocally when everything else is so downtuned. When uninitiated kids ask you what metal music is about, my suggestion to scare them off is to play a riff off Kunsult the Bones. Slowly adding drum rolls, and then nutty screams half way through, Kunsult the Bones is a statement in both simplicity and utter devastation. Nevertheless, melodic chord progression is clear, and everything fades into that ever-present fuzz. Why the trio of Steven Rathbone, Chris Wozniak and Donald James Barraca didn’t have these songs released earlier is beyond me, but now that this might saw the light of day the travesty has been corrected. For fans and those who will remain unafraid, this is heaviest doom rock there is at its finest.